Manufacturers and other companies have uncovered new value for customers, the environment, and themselves through "servicizing." Also known as "product service systems," servicizing involves offering and charging customers for the function of a product rather than the product itself. For example, when we subscribe to an internet music streaming service, we pay for listening to music instead of paying to own CDs. This typically leads to fewer products being produced, production of higher quality goods, and customers using only what they need. The Arizona State University Sustainable Purchasing Research Initiative (SPRI) has developed this website in partnership with EPA's Office of Policy as a means to share existing knowledge about the outcomes and lessons learned from servicizing approaches. We invite you to contribute relevant key findings and lessons learned regarding how servicizing approaches can be used in both the private and public sector to reduce waste while increasing value to companies and customers. 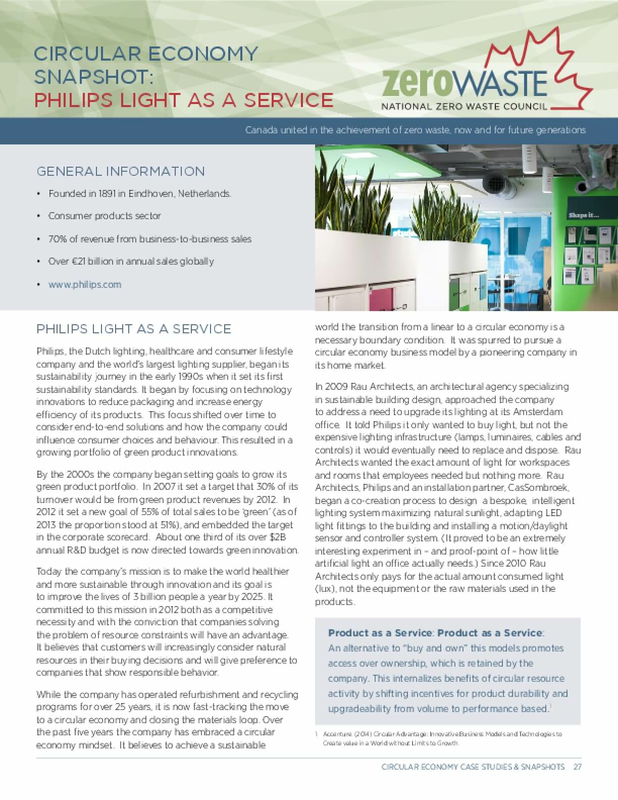 Philips, the Dutch lighting, healthcare and consumer lifestyle company and the world's largest lighting supplier, began its sustainability journey in the early 1990s when it set its first sustainability standards. It began by focusing on technology innovations to reduce packaging and increase energy efficiency of its products. This focus shifted over time to consider end-to-end solutions and how the company could influence consumer choices and behaviour. This resulted in a growing portfolio of green product innovations.By the 2000s the company began setting goals to grow its green product portfolio. In 2007 it set a target that 30% of its turnover would be from green product revenues by 2012. In 2012 it set a new goal of 55% of total sales to be 'green' (as of 2013 the proportion stood at 51%), and embedded the target in the corporate scorecard. About one third of its over $2B annual R&D budget is now directed towards green innovation.Today the company's mission is to make the world healthier and more sustainable through innovation and its goal is to improve the lives of 3 billion people a year by 2025. It committed to this mission in 2012 both as a competitive necessity and with the conviction that companies solving the problem of resource constraints will have an advantage. It believes that customers will increasingly consider natural resources in their buying decisions and will give preference to companies that show responsible behavior. A product–service system (PSS) integrates products and services to fulfill customer needs and create sustainability. PSS evaluation requires the use of diverse criteria because PSSs are complex systems with multiple stakeholders and perspectives. This paper proposes an evaluation scheme for PSS models that consists of a set of 94 evaluation criteria and an evaluation procedure. The proposed set of criteria encompasses both provider and customer perspectives, all of the 3P (profitability, planet, and people) values and various PSS lifecycle phases, whereas existing studies only partially cover these aspects of PSS. The proposed set serves as an evaluation criterion repository, and users can easily identify the criteria relevant to the evaluation targets. Using the proposed set is more efficient than starting from scratch. The proposed evaluation scheme can be used either to compare different PSS models or to evaluate a single model. Case studies show that the proposed scheme can sufficiently evaluate both existing and newly launched PSS models as well as models under development. The proposed scheme is expected to serve as an efficient and effective aid for practitioners in PSS development. Recently, a new type of innovative business models has been developed based on the premise that economic value is not necessarily associated with the production and distribution of products, but rather with the use and functionality that the products can offer. It has been argued that such models, often referred to as servicizing business models, may have a positive impact on the environment because they can enable firms to achieve both economic and environmental sustainability. However, they may also present unique implementation challenges because they require the business-as-usual relationship between the different partners in a supply chain to change from product-based to use- or function-based. 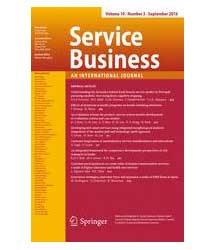 In this chapter, we outline a taxonomy of different servicizing business models observed in practice based on different operational characteristics. Based on these characteristics, we also provide an overview of the reasons why servicizing may improve environmental performance. More importantly, we also provide a discussion of why servicizing may backfire and lead to worse environmental outcomes due to the firm and/or consumer decisions. Finally, we identify implementation challenges that may prevent the adoption of servicizing business models in practice. 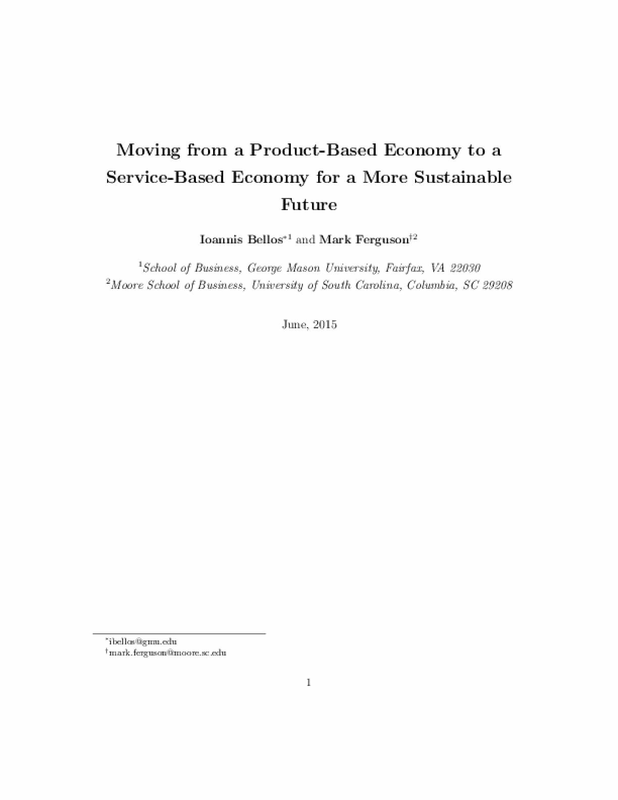 Servicizing has been identified as a business strategy that may contribute to the improvement of the environmental performance of economic activities. This paper analyses the organisational and environmental effects of servicizing in the farming sector. In particular, a case study of three Galician dairy farms which become members of cooperatives that provide them with farm machinery, heifer breeding and feeding services is carried out.The paper begins by building upon existing theoretical literature concerning servicizing and its contribution to sustainability. Then, the Compound Method Based on Financial Accounts (MC3) is used to assess the changes in the carbon footprint (CF) of the farms included in the study both before and after their integration into cooperatives.By means of servicizing the farms are released from the burden of having to make certain major investments and from having to undertake several specialised activities; in consequence they have more time and more resources to devote to their focal activity. In addition to products, the farms receive high quality services that help them to improve their efficiency and competitiveness. The paper shows a positive association between the shift to servicizing and the farms' improvement of eco-efficiency. In particular, the carbon footprint measured in relation to the number of litres of raw milk produced by each farm decreases in all three cases (within the range 16%–28%) for the period 2002–2011. An important step towards achieving sustainability is to encourage a wide uptake of more resource-efficient consumption practices by the mainstream of society. However, consumption practices are complexly interlinked with cultural values, social status, identity and other symbolic aspects of socio-economic paradigms. Historically, design has played an important role in changing well-established cultural practices by leveraging the introduction of new technologies, or legitimising values, beliefs and social practices through its representations. In this paper, it is argued that focussing on the elaboration of meanings – or symbolic features – during the design process of sustainable innovations can enhance their wider appeal, especially by positioning them as aspirational choices that contribute to the well-being and happiness of potential users. But, in order to strategically elaborate such meanings, it becomes necessary to identify the favourable social conventions at play in a given context – i.e. the best cultural codes upon which to successfully build an innovation's relevance and desirability. Semiotic and cultural analysis methods pose great potential for supporting design in this task. In this paper, an initial methodological framework for the incorporation of these methods in the design process is proposed. The theoretical proposition is explored in the context of sustainable Product Service Systems (sustainable PSS), given the opportunities they pose for systemic disruption as radical innovations and the cultural barriers for their mainstream adoption. This contribution, thus, not only offers a new theoretical perspective for considering the symbolic aspects of sustainable consumption as social signifier; but also provides a practical framework that incorporates a socio-cultural lens to user research in design practice. It also highlights the strategic opportunities that this field of enquiry opens for sustainable design to have a wider influence in societal transformation. Traditionally, economic growth and prosperity have been linked with the availability, production and distribution of tangible goods as well as the ability of consumers to acquire such goods. Early evidence regarding this connection dates back to Adam Smith's Wealth of Nations (1776), in which any activity not resulting in the production of a tangible good is characterized as unproductive of any value." Since then, this coupling of economic value and material production has been prevalent in both developed and developing economies throughout the world. One unintended consequence of this coupling has been the exponential increase in the amount of solid waste being generated. The reason is that any production and consumption of material goods eventually generates the equivalent amount of (or even more) waste. Exacerbating this problem is the fact that, with today's manufacturing and supply chain management technologies, it has become cheaper to dispose and replace most products rather than to repair and reuse them. This has given rise to what some call a disposable society." To put things in perspective: In 2012 households in the U.K. generated approximately 22 thousand tons of waste, which amounted to 411 kg of waste generated per person (Department for Environment, Food & Rural Affairs, 2015). During the same time period, households in the U.S. generated 251 million tons of waste, which is equivalent to a person generating approximately 2 kg of waste every day (U.S. Environmental Protection Agency, 2012). Out of these 251 million tons of total waste generated, approximately 20% of the discarded items were categorized as durable goods. The disposal of durable goods is particularly worrisome because they are typically produced using material from non- renewable resources such as iron, minerals, and petroleum-based raw materials. The design and delivery of services have changed tremendously over the last decade. Yet the conceptualization of services should place a greater emphasis on the social and environmental aspects of value design, and services should also be incorporated as an essential part in the production and delivery of products. 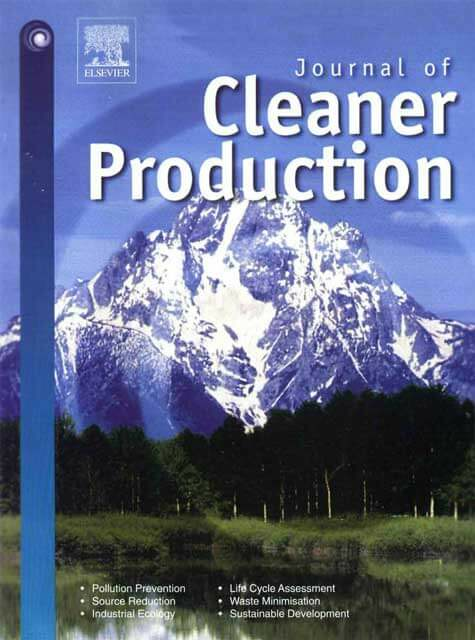 The addition of clean services (CleanServs) to the various stages of the product's life cycle can reduce both resource use and pollution emission. Moreover, servicizing the product's life cycle can also add various environmental and social values, and thereby increasing the sustainability of the final solution. Finally, the potential of servicizing to increase the sustainability of the physical resources based life cycle of goods was illustrated by the example of the life cycle of printed book. 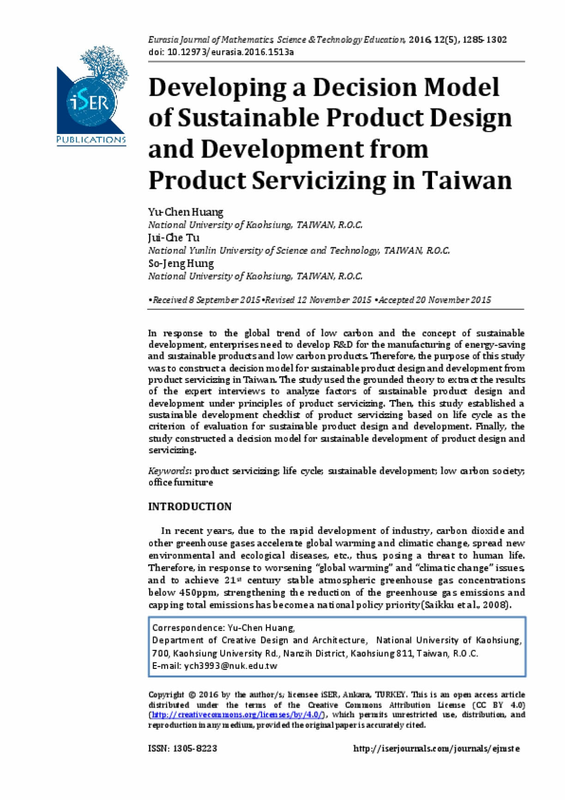 Product service systems (PSS) – integration of products and services – with aims to achieve economic profit and reduce environmental impacts, is a hot issue in academia. 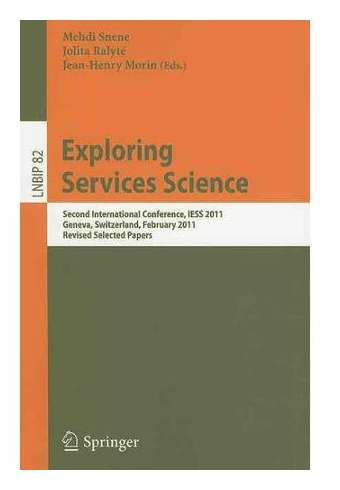 The purpose of this study is to comprehend the state-of-the-art in the field of PSS design, evaluation, and operation methodologies (PSS-DEOM) by conducting a systematic literature review. 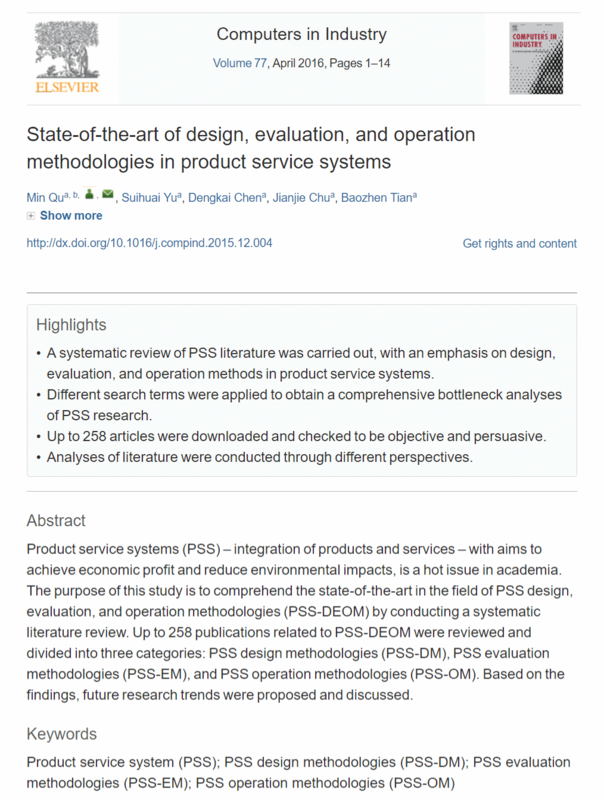 Up to 258 publications related to PSS-DEOM were reviewed and divided into three categories: PSS design methodologies (PSS-DM), PSS evaluation methodologies (PSS-EM), and PSS operation methodologies (PSS-OM). Based on the findings, future research trends were proposed and discussed. The purpose of this article is to advance empirical sustainability-evaluations of carsharing-systems. Carsharing, a frequently cited example of a product–service system (PSS), is currently morphing from a niche into a mainstream mode of transportation. Carsharing has the potential to provide a more sustainable mobility-option compared to private car usage, for example by reducing the overall motor-vehicle traffic in cities. However, the quantification of this potential is complex, and few studies have analyzed the fundamental impacts of the chosen measurement-methodology on the results of empirical carsharing-evaluations. This article analyses the time- and method-interdependencies of carsharing-studies based on a generic model structuring the adaptation of the mobility-behavior of carsharing-users over time. A paradigm shift from a static to a dynamic view on impacts of the PSS carsharing is proposed, which could support policymakers enacting carsharing-regulations in cities. The analysis of generic methodological interdependencies when conceptualizing impacts as dynamic processes is generalizable to impact-assessments of new technologies changing user-behavior over time. Heightened concerns about long-term sustainability have of late enlivened debates around the circular economy (CE). Defined as a series of restorative and regenerative industrial systems, parallel socio-cultural transformations have arguably received less consideration to date. 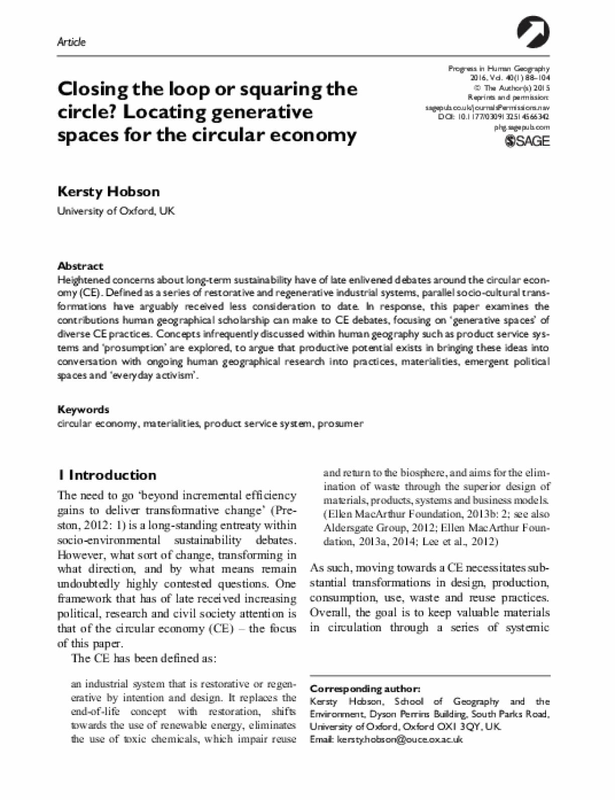 In response, this paper examines the contributions human geographical scholarship can make to CE debates, focusing on 'generative spaces' of diverse CE practices. Concepts infrequently discussed within human geography such as product service systems and 'prosumption' are explored, to argue that productive potential exists in bringing these ideas into conversation with ongoing human geographical research into practices, materialities, emergent political spaces and 'everyday activism'. 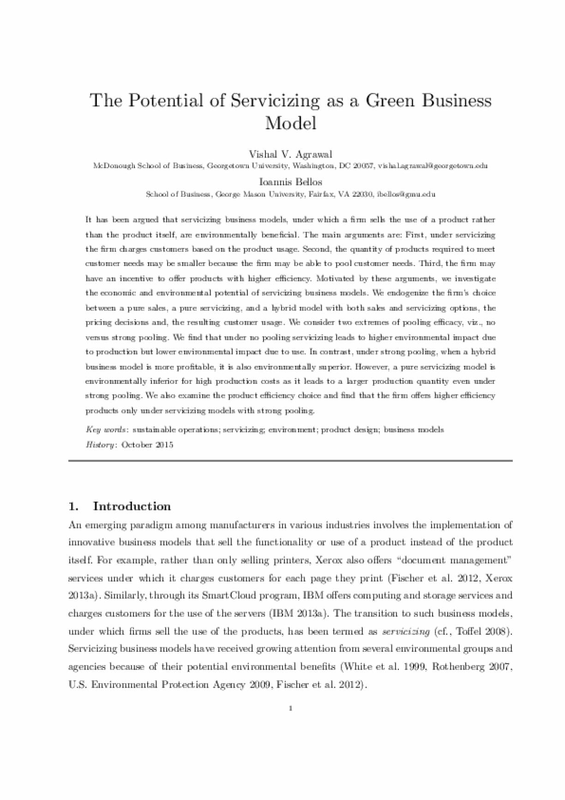 It has been argued that servicizing business models, under which a firm sells the use of a product rather than the product itself, are environmentally beneficial. The main arguments are: First, under servicizing the firm charges customers based on the product usage. Second, the quantity of products required to meet customer needs may be smaller because the firm may be able to pool customer needs. Third, the firm may have an incentive to offer products with higher efficiency. 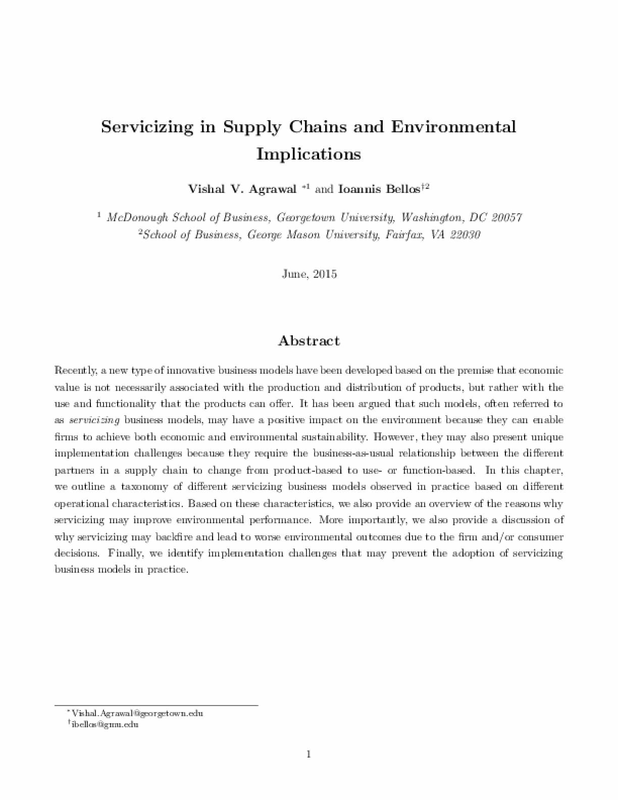 Motivated by these arguments, we investigate the economic and environmental potential of servicizing business models. We endogenize the firm's choice between a pure sales, a pure servicizing, and a hybrid model with both sales and servicizing options, the pricing decisions and, the resulting customer usage. We consider two extremes of pooling efficacy, viz., no versus strong pooling. We find that under no pooling servicizing leads to higher environmental impact due to production but lower environmental impact due to use. In contrast, under strong pooling, when a hybrid business model is more profitable, it is also environmentally superior. However, a pure servicizing model is environmentally inferior for high production costs as it leads to a larger production quantity even under strong pooling. We also examine the product efficiency choice and find that the firm offers higher efficiency products only under servicizing models with strong pooling. Circular business models based on remanufacturing and reuse promise significant cost savings as well as radical reductions in environmental impact. Variants of such business models have been suggested for decades, and there are notable success stories such as the Xerox product–service offering based on photocopiers that are remanufactured. Still, we are not seeing widespread adoption in industry. This paper examines causes for reluctance. 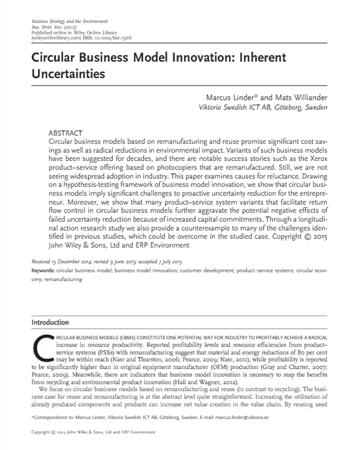 Drawing on a hypothesis-testing framework of business model innovation, we show that circular business models imply significant challenges to proactive uncertainty reduction for the entrepreneur. Moreover, we show that many product–service system variants that facilitate return flow control in circular business models further aggravate the potential negative effects of failed uncertainty reduction because of increased capital commitments. Through a longitudinal action research study we also provide a counterexample to many of the challenges identified in previous studies, which could be overcome in the studied case. Consip is a public company owned by the Italian Ministry of Finance. It operates as Italy's central purchasing body, and implements the programme for the rationalisation of public spending on goods and services through the use of ICT (Information and Communication Technology) and innovative procurement tools, such as framework contracts, e-marketplace for public administration, and a dynamic purchasing system. Italy's National Action Plan (NAP) on green public procurement (GPP) entered into force in 2008 and, since then, GPP has been one of the pillars of Consip's Rationalisation Programme. Consip's mission is to make the use of public resources more efficient and transparent, by providing tools and support to public administrations which enable them to carry out procurement procedures which foster competitive participation from enterprises. 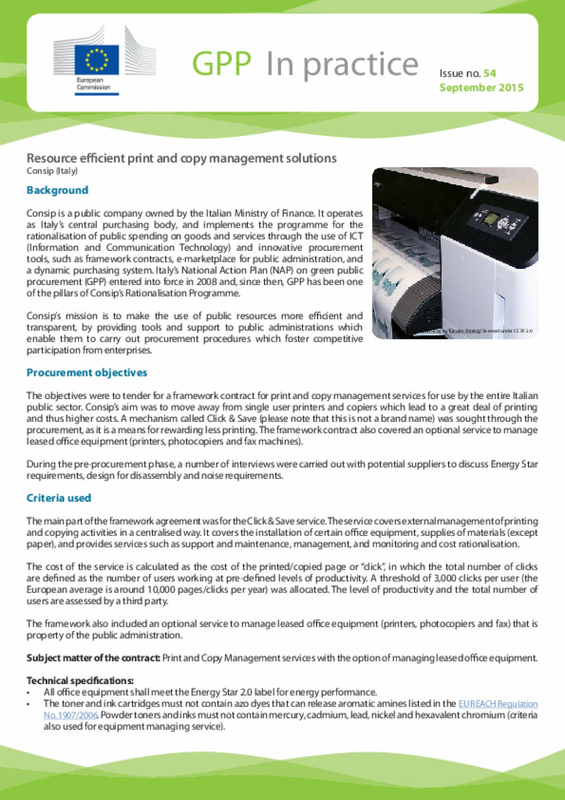 The objectives were to tender for a framework contract for print and copy management services for use by the entire Italian public sector. Consip's aim was to move away from single user printers and copiers which lead to a great deal of printing and thus higher costs. A mechanism called Click & Save (please note that this is not a brand name) was sought through the procurement, as it is a means for rewarding less printing. The framework contract also covered an optional service to manage leased office equipment (printers, photocopiers and fax machines). During the pre-procurement phase, a number of interviews were carried out with potential suppliers to discuss Energy Star requirements, design for disassembly and noise requirements. Recently, industries have shifted their focus on the combined ecosystem of products-services. The innovative business strategy of PSS provides an integrated solution that gives the potential for sustainability gains for both company and customer. Similarly to other business aspects, the PSS efficiency design is evaluated through performance indicators, during the phase of concept evaluation, which is the last phase before launching a product-service. This phase plays a critical role for the success of a PSS. A successful evaluation prevents design modifications or redesign, significantly reduces the cost and lead time of PSS development. 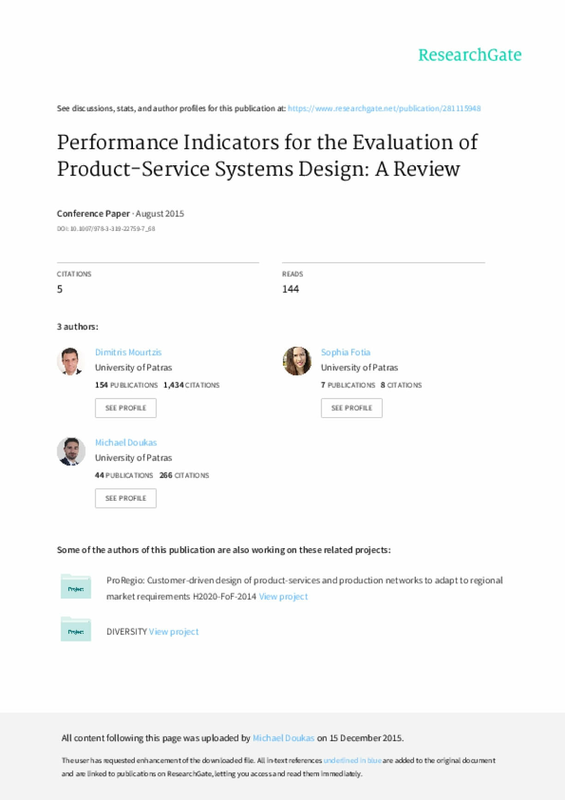 There is however, limited work on integrated evaluation approaches for PSS design models, and also a lack of a collective accounting of the most important key performance indicators (KPIs) devoted on PSS. The present work attempts to contribute in these directions, and proposes a conceptual framework for the effective evaluation of PSS design using important KPIs. Recent research shows that manufacturers' contribution to sustainable development can be improved by adopting a product service system (PSS). It is argued in this paper that such non-traditional business strategy is a crucial decision to the enterprise. Metrics need to be identified at different levels: industry, enterprise, and product. 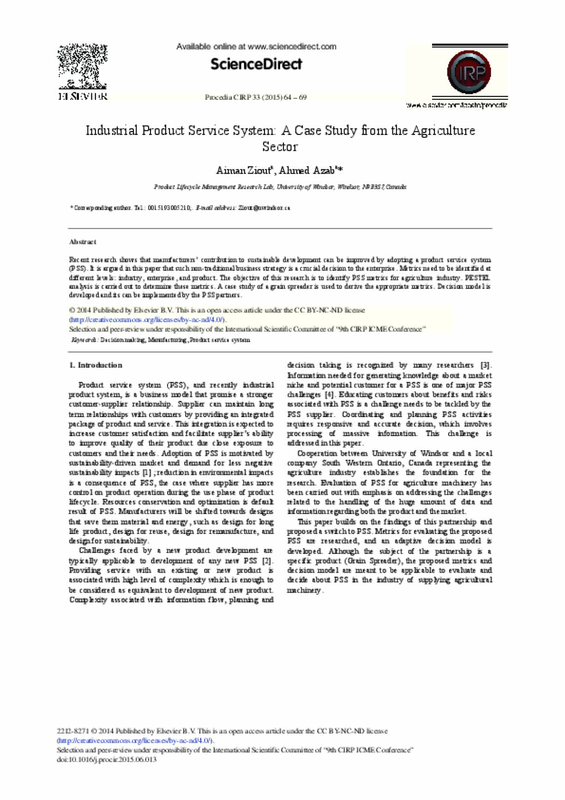 The objective of this research is to identify PSS metrics for agriculture industry. PESTEL analysis is carried out to determine these metrics. A case study of a grain spreader is used to derive the appropriate metrics. Decision model is developed and its can be implemented by the PSS partners.